For Christmas, we had the pleasure of a visit from my brother (Beez) and sister-in-law (Amanda) of Gluten Free Edmonton. Although their visit was really about seeing their nephews, Beez humoured me and made us dinner one evening between Christmas and New Years. Meredith also used her new Whirly-Pop to make everyone fresh stove-top popcorn. As I mentioned before, I'm not great with rice noodles, so it's nice to have them done right without having to go out. Beez was very accommodating and set up an assembly line on my counter. He also made me grill the chicken (so much for a labour-free dinner). Marinate chicken in soy sauce and garlic for at least 30 minutes (overnight is best). Grill chicken until cooked it reaches an internal temperature of 165-degrees Fahrenheit and then slice into strips. 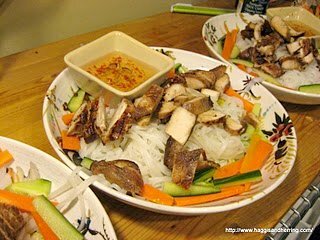 Serve with 2 tbsp fish sauce on the side for diners to pour into the bowl. I just bought some "rice sticks" the other day, so I will try this soon. Though, me no likie fish sauce. Maybe I could use some schezuan sauce instead! Thanks for sharing on the hearth and soul hop! Hmm. Trying to think what the closest thing to fish sauce is (made with anchovies). The brand GfreeYEG buys is a dip so it's not dark/strong at all (like the ones used for cooking). If you prefer something sweet, you could use Hoisin sauce and water it down with a drop of soy and some seasoned rice vinegar. that's my favourite dip for pot-stickers.